– Discovery: Keichousaurus is unique in that it is one of the only known nothosaurs found exclusively in Asia. The first known fossil was recovered in 1958 from the Chinese town of Guizhou by paleontologist Chung Chien Young. Young was very much a pioneer of vertebrate paleontology in China and he is highly regarded as one of the most respected geologists in Asia. His research into dinosaurs and other prehistoric life helped to elevate China’s importance within the paleontology world. – Description: Keichousaurus was a tiny nothosaur, with fully grown specimens measuring just 30 centimetres in length. It is one of only two nothosaurs classified within the keichousaurid sub-family and indeed, looked distinctively different from its nothosaur relatives. 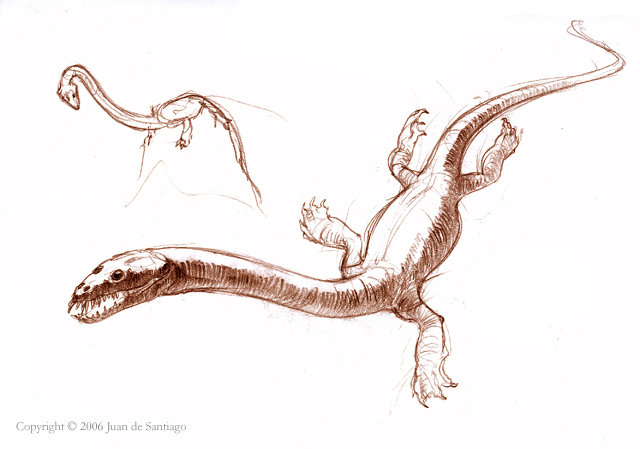 It had a very small head and a short snout but a lengthy, serpentine-like neck that would have been used to capture small, agile fish. This distinctive neck meant Keichousaurus looked more like a miniature plesiosaur and some believe that Keichousaurus is in fact a direct ancestor, or at least an ancestral form, of the later giant plesiosaurs. As well as this neck, Keichousaurus had a distinctly broad ulna. This ulna would have increased the surface area of the forelimbs, making Keichousaurus very efficient through the water. These specialised limbs likely mean that Keichousaurus was predominantly an aquatic animal, possibly more so than some of its close relatives. Each limb had five webbed digits at the end. The tail of Keichousaurus was exceptionally muscular and studies of the caudal vertebrae suggest that the tail would have been able to beat from side to side, acting as an extra mode of propulsion. The combination of powerful limbs and tail would have made Keichousaurus a highly efficient, maneuverable, underwater hunter. A few Keichousaurus fossils have been discovered with juvenile animals within the main specimen itself. The position of these young specimens, within the mobile pelvis of the adult, suggest that they are in fact waiting to be born and this suggests that Keichousaurus was viviparous, giving birth to live young rather than laying eggs. This birthing method again reinforces the idea that Keichousaurus was primarily a marine creature. This entry was posted in Triassic - Nothosaurs and tagged dinosaurs, keichousaurus, nothosaurs, prehistoric, triassic. Bookmark the permalink.